Plant based, except for the glutens. Well, what can I say? Me and my husband enjoyed a completely gluten free lunch with beer at Bruschetta in Kingston Upon Thames and I'm sad every day that I don't live closer. In fact, it was a bit of a mission to get there and find parking. But once inside, I felt as though I was in a little restaurant in Italy. The decor is a little quirky and haphazard, and the chef pops out every now and then to speak Italian to one of the customers, but the waitress was lovely and we felt really relaxed and happy to be there. I could see myself popping in for lunch every day. 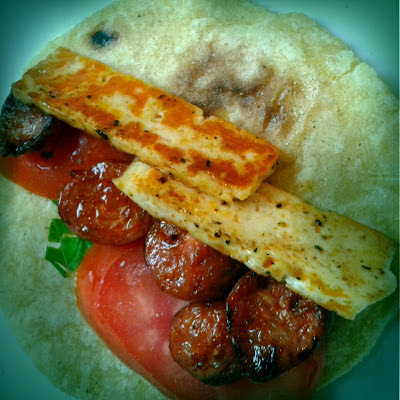 The Gluten Freek gave us GF bloggers a recipe challenge for September. The rules: You must use beetroot and the recipe must be vegan and gluten free. The last challenge was a little easier, the only rule was that you must use mint. I was quietly confident about this challenge. I've been making a lot of vegan friendly food recently as my egg intolerance is now really bad. Almost as bad as my gluten one - and the milk intolerance is catching up. I'm trying not to be despondent about it. I'm dealing with it by coming up with new recipes! The beetroot part threw me though. The last thing I made with beetroot was beetroot soup and it was so vile, I almost gave up cooking altogether. Also, my husband won't touch beetroot, so it gets relegated to my plate of cheese and pickles at Christmas. However I have found a way to make gluten free tortillas using fine cornmeal. I bought a 1.5kg bag in the Sweet Mart in Bristol for £1.39 and you should be able to get it in most big supermarkets in the 'ethnic foods' section. You can also buy it from websites such as Spices of India. *Please note that although the bag says 'gluten free' there is a risk of cross contamination with these products, so please be cautious if you have Celiac Disease or a severe allergy or intolerance to gluten.